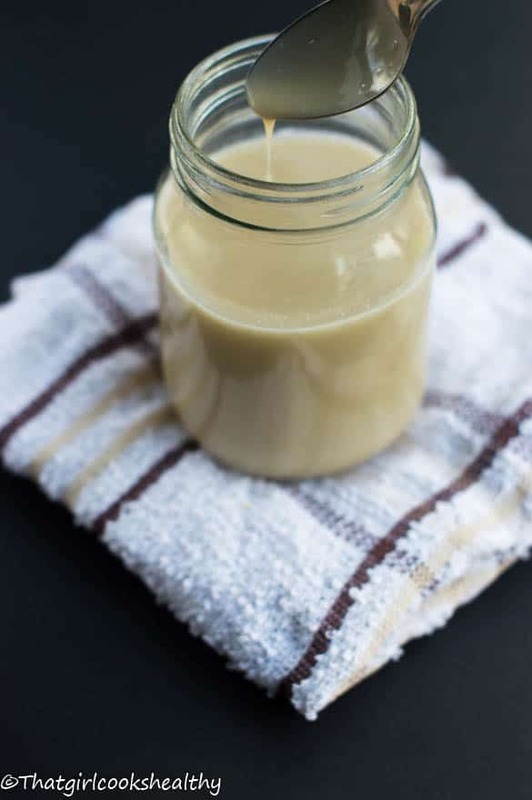 Organic condensed milk – Learn how to make this easy organic condensed milk that’s made from coconut milk making it perfect for a vegan lifestyle. After submitting my Jamaican cornmeal porridge recipe, ya didn’t think I’d leave you hanging? huh? No that’s not my style, I’m a teaser but one who is true to her word. As previously mentioned I would disclose the condensed coconut milk recipe within a few days. There are a lot of recipes floating around the web that call for full fat coconut milk from a can. I don’t have a problem with using the canned stuff if it wasn’t ladened with additives and preservatives. This made me feel very isolated from the condensed coconut milk crew as I didn’t want to succumb to the concept of using canned milk with extras plus it wouldn’t be fair on my readership. Unfortunately, homemade coconut milk won’t suffice simply because of the large volume of water needed. I tried in vain with my homemade coconut milk only to be defeated, believe me the results were humourous. I used organic coconut milk (full fat) and coconut palm sugar which has a very low glycemic index. 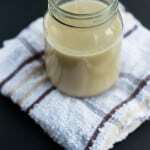 As the process of condensing milk requires evaporating the excess water this is quite time consuming but the time and effort certainly pays off. I’m talking roughly 25 minutes or so but can leave overnight to set if you wish to do so. ***** please note that this recipe has been updated since I first posted it. Start off by pouring the coconut milk into a saucepan and boil for 5 minutes on high heat. Be sure to keep a watchful eye so the milk doesn’t burn or bubble over. After 5 minutes reduce the heat to low and pour in the coconut palm sugar – whisk thoroughly. Leave saucepan to simmer for 25 minutes – through out this time, stir the mixture periodically. Around 20 minutes into the simmering the texture of the milk with begin to thicken slightly with a dark hue of brown (see picture above). To hasten up the process I have now modified the recipe with tapioca starch to thicken and reduce time so stir in the starch now. Make sure to occasionally stir during the entire cooking time. Hey Imma, yes it’s like a mystery has been solved – yes simple indeed. Ooooh, I love it. Definitely trying it. Thanks, I hope you like it too. Hi Renee, thanks for stopping by. Yes, it’s normal for the condensed milk to be darker in appearance. Also, the texture will be slightly grainly and separate as there’s no emulsifier to bind the full fat coconut milk, give the jar a shake prior to using. You can add one tablespoon of organic tapioca flour for extra thickness. If you do decide to follow this technique, you need to add mix the tapioca flour with a tablespoon of water and add with the palm sugar to the saucepan. You’re welcome Renee. No it’s definitely normal and I make this often and the colour varies for me too, so nothing to worry about there. How many ml/cups is one can of coconut milk? It should be roughly 2 1/2 cups of coconut milk. Thank you for this recipe as well as the porridge recipe! I will try this tonight! 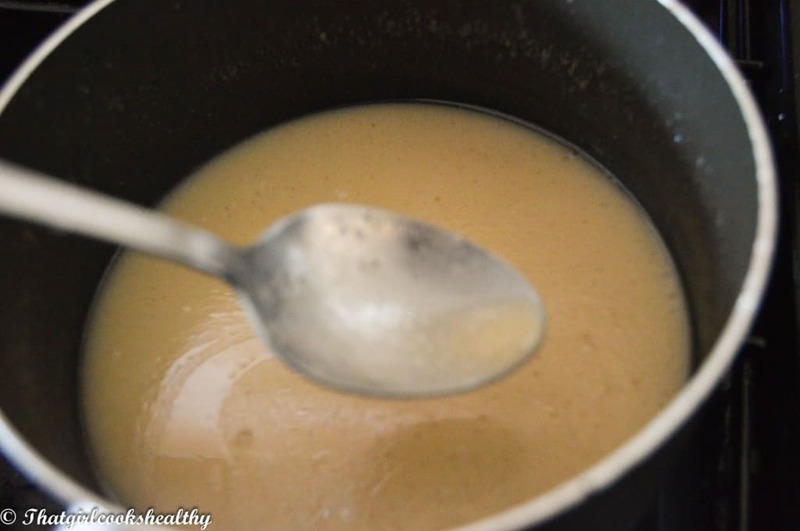 Cornmeal porridge is my favorite (grew up consuming it) and like you I was trying to make it more accommodating to my dietary needs–no refined sugar diet and sweeteners that fall in the low glycemic index . Hi Jackie, it seems that a lot of Caribbean recipes are heavily reliant on condensed milk which results in limitations for those with dietary specific requirements like yourself. 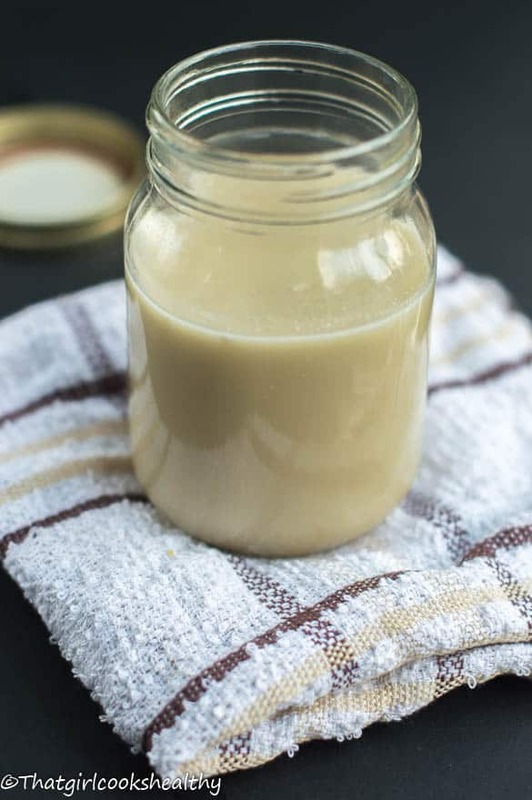 My organic condensed coconut milk is a great alternative with a low GI Index too. Definitely want to make this, do you know if is possible to make it on a slowcooker? Thanks Gisela! Unfortunately a slow cooker wouldn’t be practical for this recipe.